As you know dear reader, I very often have to pinch myself as I think I’m dreaming to be doing the job I do. Another pinch me moment came when Masa invited The Boy Wonder and I to the Tasting Table experience; we jumped at the chance to dine at this AA Guide and Good Food Guide listed restaurant, who wouldn’t? 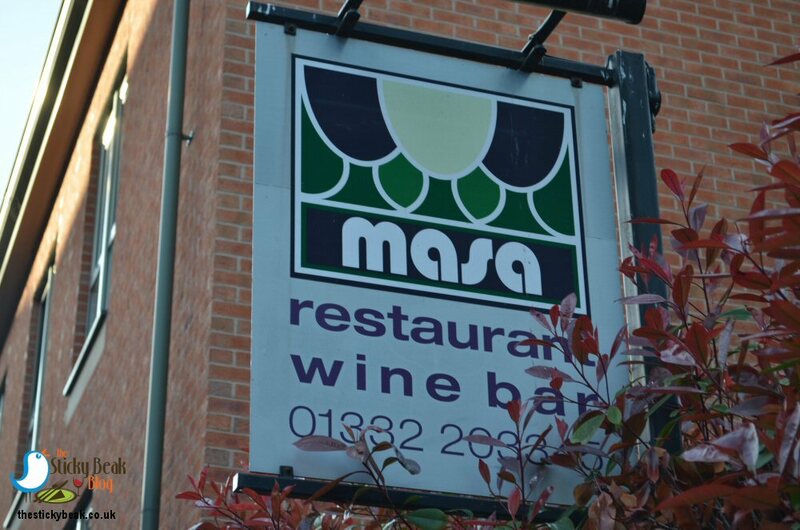 Masa is set in a Wesleyan Chapel and retains a lot of original features that I shall elaborate on in due time. The building is nestled away among several business premises which gives it an aura of mystique straight away, this being further enhanced by the two lawns set with mature shrubs behind the gateway to the property. What sprang to my mind was the book “The Secret Garden” and this only added to my sense of delight and excitement. When we went through the door we stepped into a lovely spacious Reception/Bar area with dark wood floors, sumptuous sofas and tub chairs, but what catches your eye immediately is what I assume to be the original Pulpit on the upper level painted in a Cream and Duck Egg Blue palate that contrasts beautifully with the lower floor colour scheme. We were greeted warmly and directed to sit at one of the sofas as the Tasting Table menu was handed to us to peruse whilst our drinks order was taken. A lovely young man brought us a tray of canapés to try comprising Goats Cheese on mini toasts and Ham Hock with Pineapple Gel. 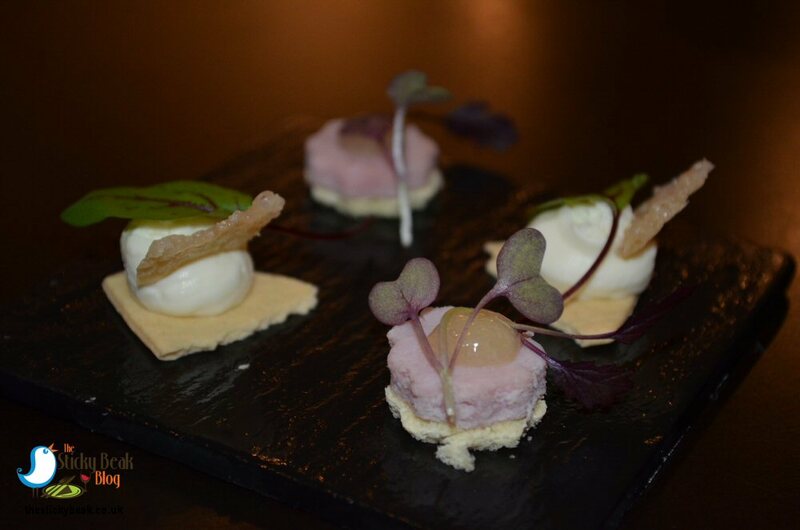 The Goats Cheese had that wonderfully fresh, clean taste to it and then we got the full meaty punch from the Ham Hock canapé with its Pineapple zippiness. 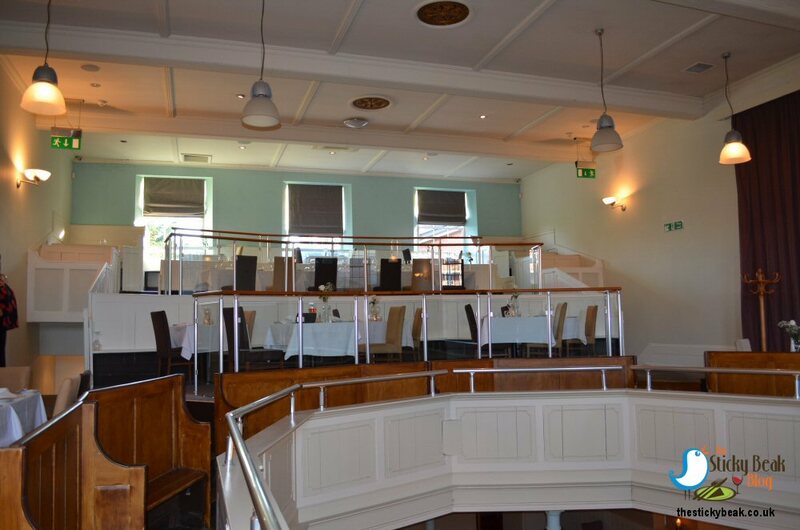 Although there are a few tables down in the reception area, rather nattily formed from the original chapel pews, the main restaurant is on the upper level. Again there are tables along both walls with the seating being the pew stalls and there are several tiers of tables in rows in the rest of the space. Each table was classically set with pristine white table cloths and fresh floral arrangements on them. 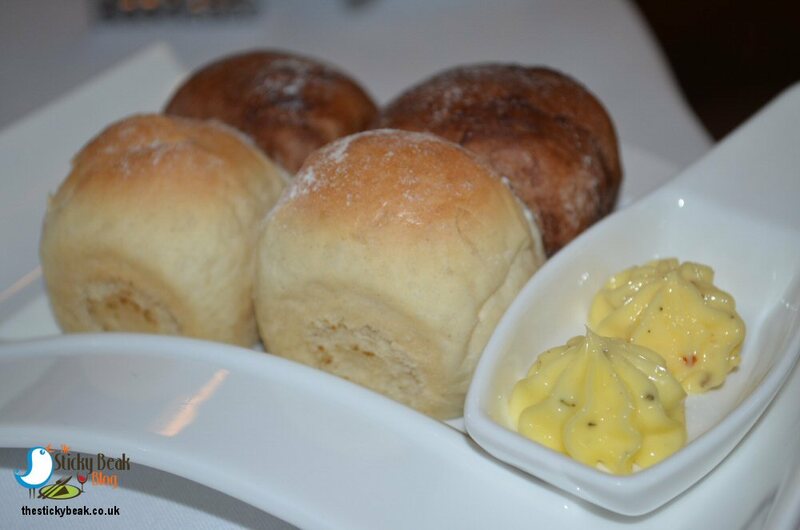 Alex, the Maitre D’, gently placed our napkins in our laps and introduced us to the Masa experience with fresh mini homemade bread loaves and butters; White Bloomer and Chocolate breads, and a pat each of Salt and Pepper, and Chilli butters. We loved the fresh black peppercorns in the butter, and we decided to pair the chilli butter with the Chocolate loaf as that is such a great combination. You got the merest whisper of chilli which, when paired with the depth of flavour from the chocolate, was a joy to eat. Before I start describing the merits of each course of the meal I am just going to state that each course was immaculately presented and had obviously been plated up with great care and skill. The photographs will give you some idea of just how good they were. Where applicable, the food was hot and the vegetables had been cooked with total precision, we really couldn’t fault anything. 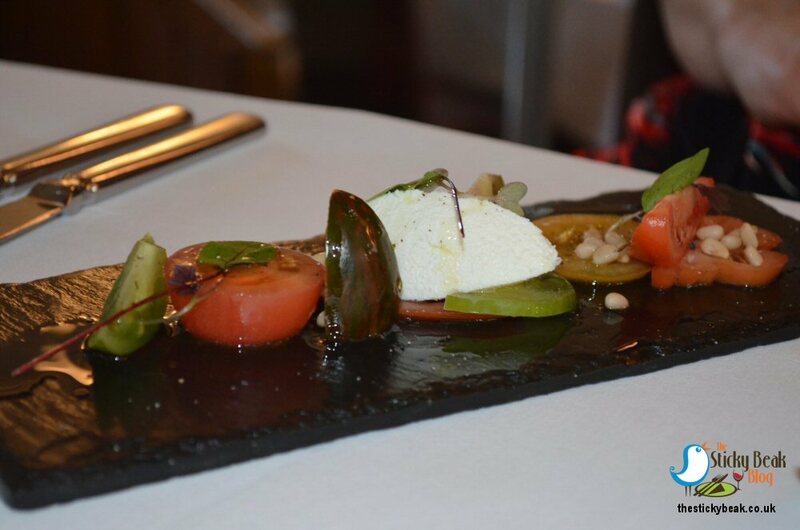 The introductory course on the Tasting Table menu was a salad of Heritage Tomatoes, Basil, Pine Nuts and Cream Cheese. I absolutely love Tomatoes, so I really appreciated the differing flavours and textures from the different varieties; His Nibs was a bit shocked that there were so many variations in colour and taste having only seen the red and green sorts in our greenhouse. 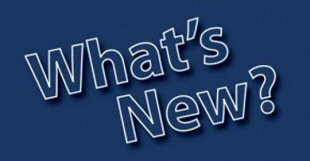 Recently, I have been on a bit of a crusade to widen The Man Birds diet, he’s always been somewhat finicky and had a few set ideas as to what he will and won’t like. As a general rule of thumb anything even remotely “healthy” has been deemed to be not to his liking, so I was very surprised, and pleased, that he tucked into the Tomatoes and actually liked them. He’s familiar with Basil and Pine nuts as I use them in my Pesto and Salads and Cream Cheese he’s ok with too, although he normally has that in Cheesecakes! I loved how the smooth Cream Cheese contrasted with the texture of the Pine nuts and the fresh Basil note was lovely. This was a visually striking dish with all the colours, and set the tone for what we were sure would be a great evening. Next up was a Poached Hilcrest Farm Duck egg with Asparagus, Parmesan and Summer Truffle and this had been poached absolutely perfectly so that the Yolk had thickened enough to be eaten with knife and fork but hadn’t solidified at all. 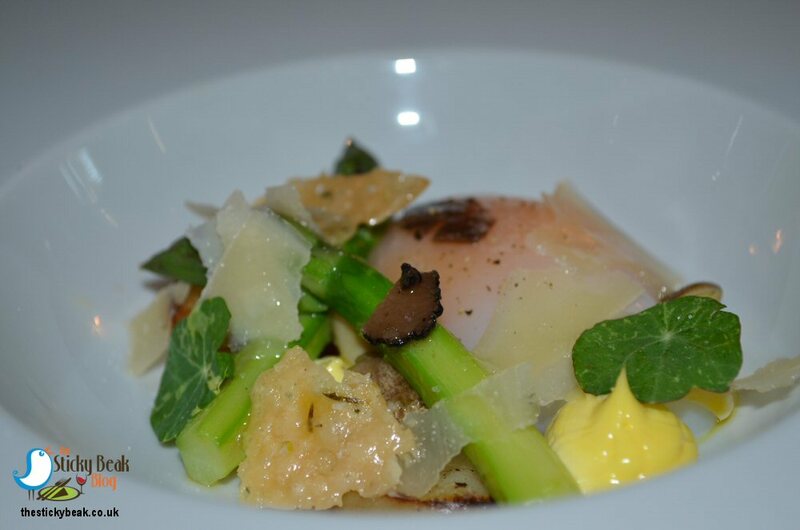 Again, poached egg and Asparagus spears are a classic combination and the flavours from the Parmesan and Truffle made this a really sumptuous dish to savour. Course number three was the one that I thought His Nibs might have issue with, but again he stepped up to the plate and gave it a go (with the exception of the Coral). 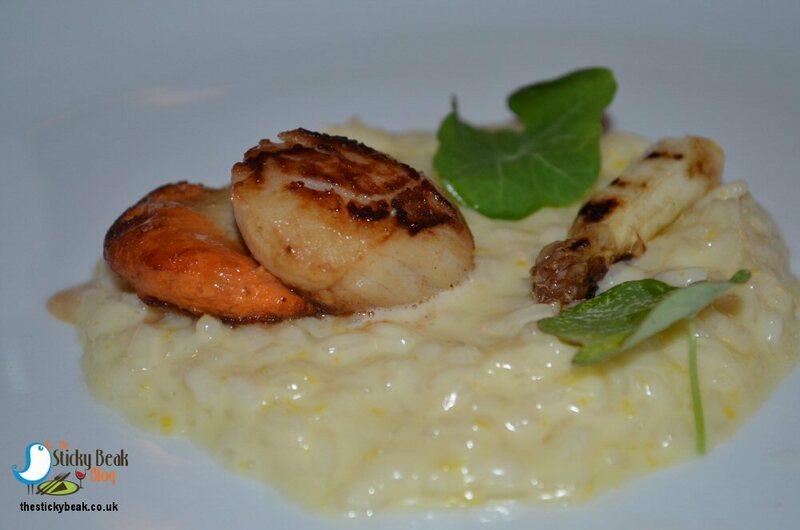 White Chocolate Risotto was paired with Seared Scallops and Lemon, and I was really looking forward to this course being the Seafood-a-holic that I am. This dish had a delicate flavour to it that suited the accent from the Lemon oil fantastically well, and the meaty Scallops and earthier Corals had been cooked marvellously. His Nibs said that he really enjoyed the Scallops, much to his surprise and earlier apprehension, and put this down to the use of top quality ingredients and a maestro chef, namely Matt. Following the Seafood had to be a meat course really didn’t it? 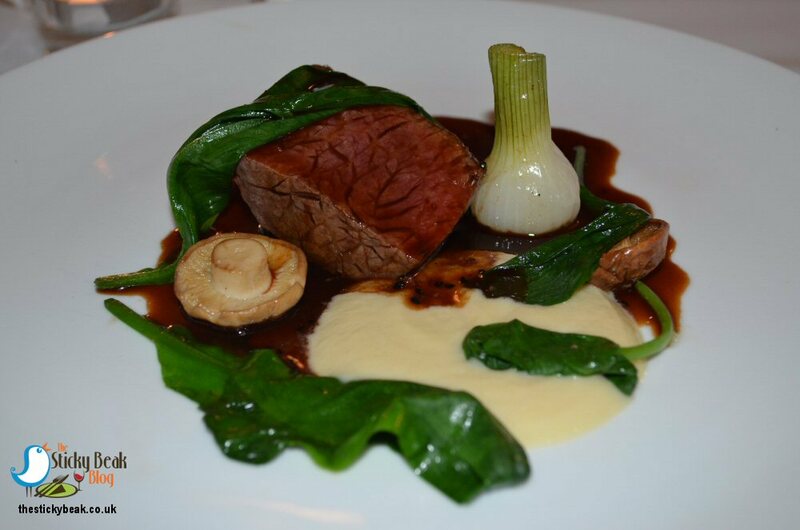 However the Fillet of Derbyshire Beef didn’t meekly follow the Seafood, it bellowed its presence and stood proudly on the plate with St Georges Mushrooms and Wild Garlic. Although this was presented rare (much to my delight) there was no trace of blood at all, which suited The Boy Wonder as he is one of those “can’t even be merest hint of blood at all on the plate” types. Alex placed the plates gently before us and poured a rich gravy onto both plates simultaneously from little jugs for a fantastic piece of culinary theatre. Wild Garlic is only in season for a short while but has such a lovely rounded flavour that enhances so many other notes, and in this case went very well with the mushrooms. The beef itself was nothing short of sublime; it melted on the tongue, had a wonderful deep taste and was so tender that no pressure was needed at all to slice into it. Course number five is Optional and we opted not to have it, as it was cheese. I could quite happily have munched Masa’s entire cheese supply, but The Man wasn’t feeling quite brave enough to have a gamut of Cheese before him and considering he had done so well, I let him off. Just for information though, this course is a selection of British and European Cheeses with Grape Granita and Sultana Jam which sounds heavenly to me and I’m sure it would have been as thrilling as previous dishes. 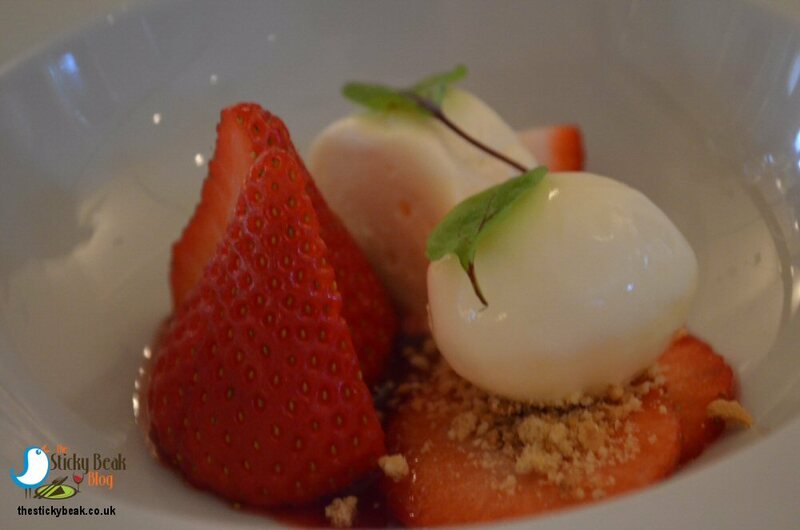 There are two dessert courses on the Tasting Table menu, the first being fresh Strawberries with reduced milk and cream. The Strawberries were as nature intended them to be, magnificent ruby delights absolutely bursting with vibrant juices, and this intensified the rich decadence of the cream, which again seemed deeper than usual thanks to the taste of the reduced milk. To me, the reduced milk was how I imagine solid single cream to be so you see why this would intensify the actual cream flavour into a comparatively full on, sinfully rich wee beastie. 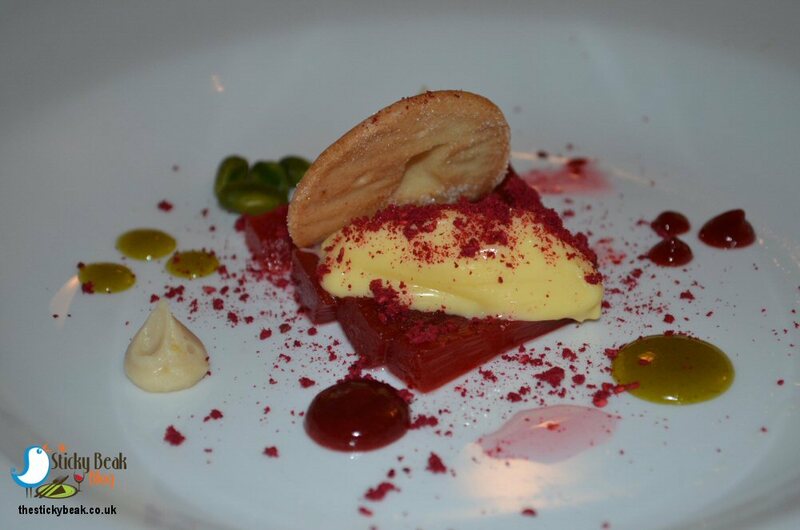 The last of the food courses, but by no means least, was Rhubarb with Egg Custard, Pistachio and Shortbread. The actual Rhubarb was still nicely firm with natural crunch and was beautifully sweet with just that delicious sharp note to it that tingles the taste buds, and this married superbly with the rich, smooth Egg Custard. Texture and crunch were delivered perfectly by the Pistachio nuts and the crumbly, rich Shortbread topped it all off like an Opera Diva hitting that wonderfully high note. It goes without saying that every single morsel, right down to the most miniscule crumb, had been a pinnacle of culinary perfection. The Man Bird and I had had a momentous evening enjoying our fine dining experience with the wonderful team at Masa and to round things off we were served with fresh coffee and a selection of Petit Fours. No surprise that Him Indoors snaffled the Chocolate Brownie, but I had first dibs on the White Chocolate and Raspberry confection, and we shared the Dark chocolate Praline and Violet Fudge, which were both ridiculously good. The Tasting Table menu is available on Monday, Wednesday, Thursday & Friday at a price of £45 per person (the optional cheese course is an additional £5 per person) and you can also choose to do a wine pairing with each course for an extra cost. The standard menu is also available on Tasting Table nights, if you want a briefer meal.